You don't need an ice cream maker to create delicious ice cream. It's a treat that's easy to make with or without the appliance. Ice cream makers come in a variety of styles, from inexpensive hand-cranked tubs to more expensive models with compressors. Choose the one that best fits your budget and your need for ice cream. You'll find a variety of ice cream makers to choose from, and most do the job quite well. But the less expensive large-quantity ice cream makers require several pounds of ice and rock salt for each batch. They're also bulky, so storage space might be a consideration. You won't have the mess and added cost of ice and rock salt with the smaller countertop models such as the Cuisinart or La Glaciere. With these and similar varieties, you just freeze the 1- to 1 1/2-quart bowl, pour the ice cream mixture in, and turn it on. The bowl is a special canister with a liquid refrigerant sealed between the walls. If you make ice cream frequently, you might opt for a more expensive machine with a built-in compressor. You don't want to buy an ice cream maker? Here are a few good ways to make ice cream with ice, rock salt, and no mechanical help. Still freeze: Prepare an ice cream mixture, place the mixing bowl in the freezer. Take the bowl with the ice cream out a few times while it's freezing and mix your ice cream with a hand mixer or pulse with a food processor. The rolling can method: Put your ice cream mixture in a 1-pound coffee can, seal well with top and tape, and place it in the center of a 3-pound coffee can. Layer ice and rock salt in the space between the cans. Seal the large can, place it on its side on the ground or floor, then roll back and forth with your feet for about 10 to 15 minutes. Take the small can out, wipe the rock salt and water off, then stir. Reseal the can and repeat the rock salt, ice, and rolling. The plastic bag method: Similar to the rolling can method using rock salt and ice, but use a 1-pint well-sealed plastic freezer bag in a 1-gallon sealed plastic bag. Shake until frozen. Some of the best and richest ice creams are made with eggs. If your recipe calls for uncooked eggs, consider using the equivalent amount of egg substitute or cook the eggs and milk (to at least 170° F) as in some of the recipes below. You might also find pasteurized eggs in your local market. To keep ice crystals from forming in opened containers of ice cream, place a piece of plastic wrap right on the surface of the ice cream, making it as airtight as possible. Close the carton well and return it to the freezer. To soften very hard ice cream, microwave on 30 percent power for 20 to 30 seconds. The time varies with fat content, so check after 20 seconds. When making homemade ice cream in a machine using rock salt and ice, use a ratio of about 1 cup of salt to 6 cups of ice. Serve ice cream in slices instead of scoops. An electric knife slices your ice cream well. Freeze newly-made ice cream for about 4 hours before serving. This is also known as "ripening." Carefully wipe the water and salt off the ice cream container lid before opening. If you don't have time to make ice cream from scratch, customize your purchased ice cream. Soften the ice cream just enough to enable you to stir in chopped nuts, candy pieces, miniature marshmallows, or brownie or cookie pieces. Return to the freezer until firm. Fresh cherries and semisweet or bittersweet chocolate are featured in this creamy ice cream. If you like Cherry Garcia ice cream, you'll love this one. This ice cream has it all! Peanut butter cookie dough and mini or regular chocolate chips are scattered throughout the rich chocolate ice cream. This ice cream is similar to the famous stracciatella gelato. The chocolate flecks are made by drizzling in chocolate ganache near the end of the freezing time. This chocolate ice cream is rich, creamy, and loaded with chocolate flavor. The ice cream is made with unsweetened cocoa in a simple cooked-custard base. The tang of the buttermilk gives this amazing ice cream wonderful flavor. It can be made with sour cream as well. Along with the chopped walnuts add some maple flakes, which give the ice cream a little extra crunch and even more maple flavor. This is a fantastic ice cream to serve with an apple dessert, or enjoy it with a drizzling of maple syrup. This ice cream is the perfect dessert for a Fourth of July cookout. Swirls of vibrant red raspberry sauce and chunky blueberry jam are frozen into a basic homemade vanilla ice cream. Don't wait until July— enjoy this fabulous ice cream any time of the year. Sweet potato puree turns this ice cream into Southern bliss. This creamy ice cream will impress your friends and family. This fabulous blackberry ice cream includes sour cream, which adds a subtle tang to the blackberry flavor. And look at the color. Homemade peanut butter sauce is swirled into this awesome ice cream. It's made with a basic vanilla custard base. Imagine chocolate sauce on this one. This is a great way to use fresh blueberries. 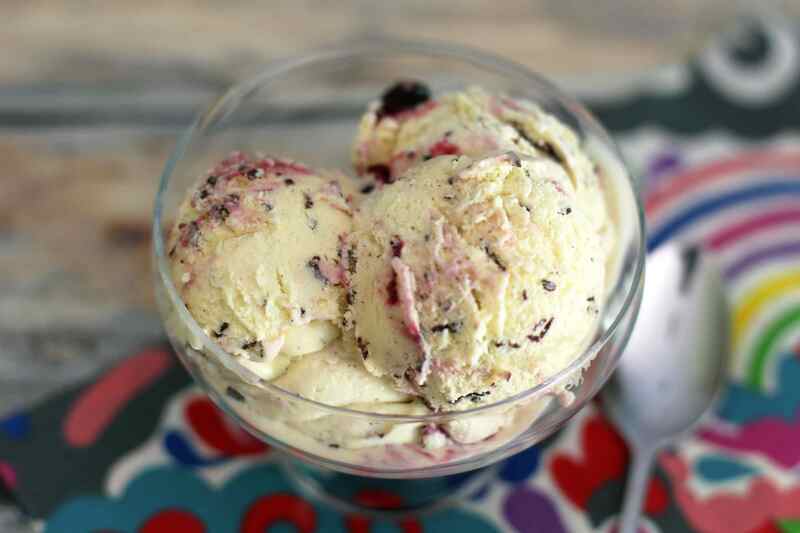 Top this yummy ice cream with fresh blueberry sauce. If you're lucky enough to have a rhubarb plant in your garden, you likely have plenty of rhubarb to make this ice cream. This is an excellent way to enjoy your plant.